What is eQuip! Enterprise Asset Management System? eQuip! Enterprise Asset Management System is a flexible, extensible, and ambulatory EAM solution. It has four deployment options for you to choose which one suits your needs and your budget best, making it both accommodating and cost-effective. You can fully implement eQuip! Enterprise Asset Management System in 4 to 6 weeks. After the initial set-up, you can utilize its wide variety of tools and features to ensure that all your assets are accounted for and to start cutting down on related overhead. Additionally, eQuip! Enterprise Asset Management System can connect with third-party systems to make it easier for you to share and to transfer information about your assets and network. Though eQuip! Enterprise Asset Management System is an application dedicated to assisting you in organizing and managing your organization’s assets, it is designed as a platform that you can connect with third-party systems. This feature enables you to seamlessly share and transfer data between your connected solutions. Each company has its own unique needs. The designers of eQuip! Enterprise Asset Management System understand that, which is why the solution has multiple deployment methods. You can choose to acquire the solution via SaaS or you can have it in the cloud or on-premises. These options enable you to find one that can accommodate your organization’s structure best. Aside from being able to be deployed in cloud environments or on-premises, eQuip! Enterprise Asset Management System can also be used on mobile devices. With this, you can perform asset tracking easily using your Android, iOS, or Windows mobile device. The dedicated mobile apps enable you to integrate with RFID readers as well to make your inventory management more streamlined. eQuip! Enterprise Asset Management System’s enterprise pricing is straightforward. All its editions are replete with the tools and features necessary for conducting a comprehensive asset management. There are no optional or additional modules to purchase and there are no seat-based licenses as well. Moreover, there is only a one-time fee for training and onboarding new customers. Four to six weeks may sound like a long wait, but eQuip! Enterprise Asset Management System delivers results. The specified period is necessary for the solution to gather the necessary data to reduce your workload for when it is time for you to take over the software fully. If you are considering eQuip! Enterprise Asset Management System it might also be sensible to check out other subcategories of Best IT Asset Management Software collected in our database of SaaS software reviews. Each enterprise has its own characteristics, and can need a specific IT Asset Management Software solution that will be designed for their business size, type of customers and staff and even particular niche they deal with. We advise you don't count on finding an ideal software that is going to be suitable for every company no matter what their background is. It may be a good idea to read a few eQuip! Enterprise Asset Management System reviews first and even then you should keep in mind what the service is intended to do for your business and your employees. Do you need an easy and straightforward service with just basic functions? Will you actually use the advanced functionalities required by experts and big enterprises? Are there any particular features that are especially useful for the industry you work in? If you ask yourself these questions it is going to be much easier to find a solid solution that will fit your budget. How Much Does eQuip! Enterprise Asset Management System Cost? eQuip! Enterprise Asset Management System has four enterprise pricing option for SaaS, cloud-hosted, and on-premises deployment. The varying asset tiers and pricing models are outlined below for you to find one that is most suitable for your organization. The hosted versions of eQuip! require an annual fee for software maintenance and support. We realize that when you make a decision to buy IT Asset Management Software it’s important not only to see how experts evaluate it in their reviews, but also to find out if the real people and companies that buy it are actually satisfied with the product. That’s why we’ve created our behavior-based Customer Satisfaction Algorithm™ that gathers customer reviews, comments and eQuip! Enterprise Asset Management System reviews across a wide range of social media sites. The data is then presented in an easy to digest form showing how many people had positive and negative experience with eQuip! Enterprise Asset Management System. With that information at hand you should be equipped to make an informed buying decision that you won’t regret. What are eQuip! Enterprise Asset Management System pricing details? What integrations are available for eQuip! Enterprise Asset Management System? eQuip! 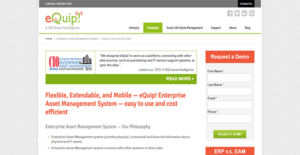 Enterprise Asset Management System is able to integrate with ERP systems and IT discovery software. If you need more information about eQuip! Enterprise Asset Management System or you simply have a question let us know what you need and we’ll forward your request directly to the vendor.